Egham, 21st October, 2016 – Powerful printers within OKI Europe’s new colour portfolio are giving retailers new solutions that will drive footfall into stores, boost revenue and increase average transaction value. “These innovative and affordable printers have been especially designed to help retailers meet all the fast-evolving challenges they face,” says Tetsuya Kuri, EMEA Vice President Marketing, OKI Europe Ltd. “From full-colour banners, flyers and signage to labels and vouchers, OKI’s new range of colour printers will meet every need, combining state-of-the-art print technology and software that will transform working processes and boost productivity. Both the C542 and MC573 have a customisable 7” touch-screen and benefit from OKI’s open platform sXP (smart Extendable Platform). This enables connection to document management software SENDYS Explorer LITE at no extra cost, providing a highly cost-effective route to secure document management and control. It also provides integration with third-party applications such as PaperCut andDrivve and a software development kit is available for rapid creation of tailor-made solutions. Small workgroups can also use this to connect to an existing pull printing fleet. A retailer can for example design promotional materials at their headquarters and share materials with local branches through Sendys Explorer. The store manager only has to walk up to the MFP in store, authenticate and print promotional materials on demand. OKI helps retailers to cut costs, save time and adapt to changing conditions instantly, without a long lead time. The new portfolio’s C823/C833/C843 printers also meet the need in larger stores for high-volume reliability along with top-quality colour for in-house, on-demand printing of marketing materials from brochures to banners. These A3 printers are a perfect fit for retail, combining a small footprint – enabling retailers to optimise in-store space for SKU sellout and an enhanced customer experience – with high capacity consumables and the ability to cope with back-office printing requirements. They are also packed with valuable security features such as Private Print and Optional Card Release to help keep confidential documents safe. The C542 and MC573 are compatible with AirPrint by Apple Inc and all devices are Google Cloud Print 2.0 ready to facilitate printing while working remotely and Wireless Direct which enables the secure concurrent connection of wired and wireless networking. Gigabit Ethernet is also standard for easy transfer of large colour files. 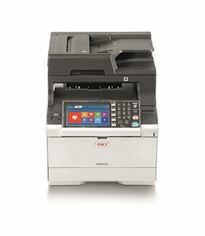 “These advanced printers in OKI’s new colour printer range, with their capacity to print eye-catching, high-definition display materials or sales collateral at the touch of a button give retailers a new ability to react quickly to fast-changing requirements, get ahead of the competition and meet all the intense demands of omni-channel retail,” said Kuri. “We are providing complete solutions that build on our long experience of working with major retailers and recognise that today there are multiple pressures, from increased customer expectations to the need for rapid production of high-quality display materials while keeping a lid on costs. For further information please visit www.okieurope.com.